Protein Blend (soy protein isolate, calcium caseinate, whey protein isolate), maltitol, coating (maltitol, cocoa butter, chocolate, sodium caseinate, milk fat, soy lecithin, natural flavors, salt), glycerin, almonds, water, soy crisps (soy protein isolate, tapioca starch), alkalized cocoa, canola oil, soy lecithin, natural flavors, chocolate, sea salt. Protein blend (soy protein isolate, whey protein isolate, calcium caseinate), maltitol, glycerin, coating (maltitol, cocoa butter, chocolate, sodium caseinate, milk fat, soy lecithin, natural flavors, salt), peanuts, water, canola oil, peanut flour, sea salt, natural flavors, soy lecithin. Contains: Milk, peanuts, soy. Manufactured in a plant that processes eggs, and tree nuts. Protein Blend (soy protein isolate, calcium caseinate, whey protein isolate), glycerin, maltitol, coating (maltitol, cocoa butter, chocolate, sodium caseinate, milk fat, soy lecithin, natural flavors, salt), soy crisps, (soy protein isolate, tapioca starch), canola oil, peanuts, water, natural flavors, soy lecithin, almonds, sea salt, citric acid. Contains tree nuts (almonds), milk, peanuts, soy. Manufactured in a plant that also processes egg and tree nuts. Protein Blend (whey protein isolate, soy protein isolate, calcium caseinate, casein). glycerin, coating (maltitol, cocoa butter, chocolate, sodium caseinate, milk fat, soy lecithin, natural flavors, salt), maltitol, alkalized cocoa, cocoa soy crisps (soy protein isolate, alkalized cocoa, tapioca starch), peanuts, water, canola oil, natural flavors, soy lecithin, coffee. Protein Blend, (soy protein isolate, whey protein isolate, calcium caseinate), maltitol, , glycerin, coating (maltitol, cocoa butter, chocolate, sodium caseinate, milk fat, soy lecithin, natural flavors, salt), almonds, water, alkalized cocoa, canola oil, natural flavors, soy lecithin, chocolate, sea salt. Manufactured in a plant that also processes eggs, peanuts, and tree nuts. Protein blend (soy protein isolate, calcium caseinate, whey protein isolate), glycerin, coating (maltitol, cocoa butter, chocolate, sodium caseinate, milk fat, soy lecithin, natural flavor, salt), maltitol, peanuts, soy crisps (soy protein isolate, tapioca starch), water, sunflower oil, natural flavor, sunflower lecithin, sea salt. Protein blend (whey protein isolate, soy protein isolate, casein, calcium caseinate), coating (maltitol, cocoa butter, milk fat, sodium caseinate, soy lecithin, natural flavors, tocopherols), glycerin, maltitol, water, peanuts, alkalized cocoa, soy crisps (soy protein isolate, rice flour, salt), cocoa soy crisps (soy protein isolate, alkalized cocoa, tapioca starch), natural flavors, canola oil, soy lecithin, chocolate, sea salt. Allergy Information: Manufactured in a plant that processes tree nuts and egg products. Protein blend (soy protein isolate, calcium caseinate, whey protein isolate) coating (maltitol, cocoa butter, chocolate, sodium caseinate, milk fat, soy lecithin, natural flavors, salt), glycerin, maltitol, peanuts, water, peanut flour, canola oil, natural flavors, soy lecithin, sea salt. Contains: Milk, peanut and soy. . Protein blend (soy protein isolate, whey protein isolate, calcium caseinate), coating (maltitol, cocoa butter, milk fat, sodium caseinate, soy lecithin, natural flavors, tocopherols), maltitol, glycerin, soy crisps (soy protein isolate, tapioca starch), almonds, canola oil, water, natural flavors, soy lecithin, sea salt, citric acid, ascorbic acid. Contains tree nuts (almond), milk and soy. Manufactured in a plant that also processes eggs, peanuts and tree nuts. Contains Tree nuts (almond), milk and soy. Manufactured in a plant that also processes eggs and tree nuts. Protein blend (soy protein isolate, whey protein isolate, calcium caseinate), white chocolate coating (maltitol, cocoa butter, milk fat, sodium caseinate, soy lecithin, natural flavors, tocopherols), maltitol, glycerin, almonds, water, canola oil, soy crisps (soy protein isolate, tapioca starch), natural flavors, soy lecithin, sea salt. Manufactured in a plant that also processes tree nuts peanut and egg. Think Thin bars are a wholesome natural bar that taste great and are wheat and gluten free. See what Team PricePlow had to say about them when we reviewed them on the airplane!! The ideal meal replacement for a low carb lifestyle. Bring incredible delicious energy wherever you go. * Current research supports a healthy low carb diet as a key component in improved health and weight loss. * At Think Thin Products, we have spent many years developing a low carb, high protein, all natural product that is good for your years to come. Think Thin does not include artificial sweeteners, fillers and additives found in many other bars. 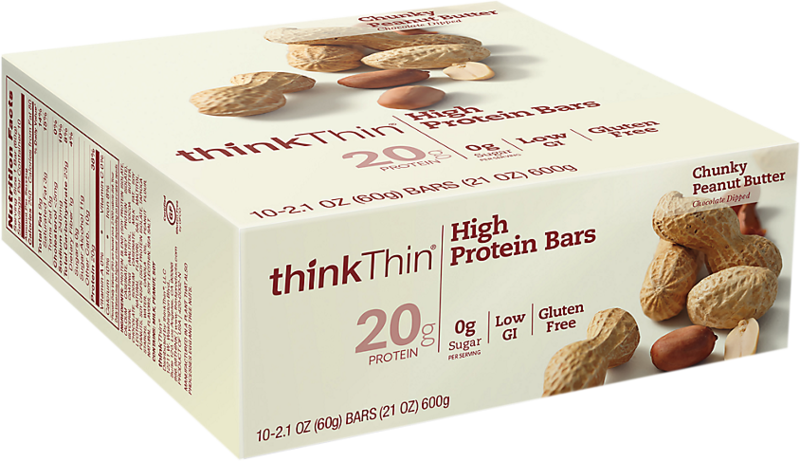 Think Thin uses natural ingredients to create a nutrition bar that is: sugar free, great tasting, only 2 grams of effective carbs, wheat & gluten free (except S'mores), GMO free, palm kernel oil and cotton oil free, Sucralose free, 20 grams of protein.